Glad you could find it…misplaced it. “Well, now, that’s a secret and you have to work for it. Do you know where there’s a rainbow? Something might be stashed there. I’m not really familiar with this part of the country?” His mischievous eyes stared back at me, filled with age-old secrets. I slammed the closet door hoping he was just a delusion and that he’d disappear. Nope. When I eased open the door, peered around the edge, there he was all green and happy. “Thought you’d get rid of me? Not so easy. I need your help to find me kin. They’re down in the Bowery. Do ye know about that place?” I felt as if I had been thrown back in time to the early 1900s and this little green man wanted me to find a trolley and his relatives that had come over from the Potato famine. “If I find your relatives, can I have your gold?” He studied me and I could see him working on the angles. Remembering the old legends, I grabbed his coattail hanging on for dear life because I knew the old crafty fellow would scamper away as soon as possible and I’d be without any reward. “You and me …we’re going to be kin today. Where you go, I go.” I was determined to mine that pot of gold wherever it was. “Well, I don’t know,” he said. You’ll have to be swift, and … oh, by the way, can you fly? We have to do a wee bit of flying,” and he flew out of the closet with me dragging behind clutching on to his coat by a thread. When I fell out of bed and landed on the floor with a thud, I knew it was all a dream, too much green beer the night before. Oh how cute! You had me going, I didn’t realize it was a dream. Very good. Dreaming of little guys in green…the dilemma how to top your delightful nugget? You can top my nuggett by writing on the prompt of the leprechaun. 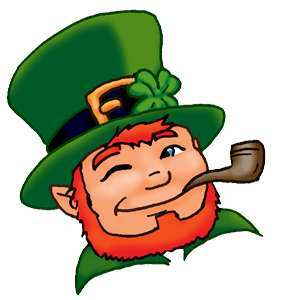 WHAT ARE YOU DOIN IN MY CLOSET, YOU’RE A LEPRECHAUN…. His eyes glowed, most alarming though not scary just annoying in an ET in my closet kinda way. Slamming the closet door I shoved a potting bench under the door jam to secure the door. Then deciding the keyhole needed to be block if he could vaporize through, I shoved a clay pot shard in the hole and teeth tore a piece of duct tape over the hole. Mentally brushing my hands together and thinking to myself that should hold him, now coffee I seriously need coffee, now. Clancy, my big red floppy earred Irish Setter sat as sentry of the closet door. Sipping the liquid caffeine in the “What Deadline?”mug, waiting for the jolt to reach my bloodstream, I sat cross legged watching Clancy as he cocked his head as if he was listening to “who knows what?”. Okay, time to move, but I’m not thinking about the little green man in the closet. In total denial mode. Tying the glittery green ribbon around the miniature pots spray painted gold and holding a shamrock plant in each they were ready for delivery. Plants loaded in the van, I decided to tell, Greenie, ” Bye Bye”. Seeing nothing In the closet, I began to question if it had really happened since I was apparently only talking to Clancy, not little green guy. Really? I began and could not stop LOLing (laughing out loud) all the way to the writer’s meeting. With tears of laughter streaming down my face, our trio approached our meeting spot. The writers are all open with a welcoming manner, so our trio didn’t even raise an eyebrow they all just wanted to know what is funny and if they could write about it, too. Oh what a delightful story Annette. The wee people can give us lots of laughs and are good imagination and writing excercises. Very good. Thanks for the smile on my face. Great imagination it was fun reading your writing. So glad you brought the little green guy to CCWriters meeting! Ah, you know me so well. So time is up lets see what you got?